Welcome to C++ Video Access Project! This site is about Captioning/Translating the C++ Videos. The site is intended to be community-driven; the C++VAP pages, links, etc. 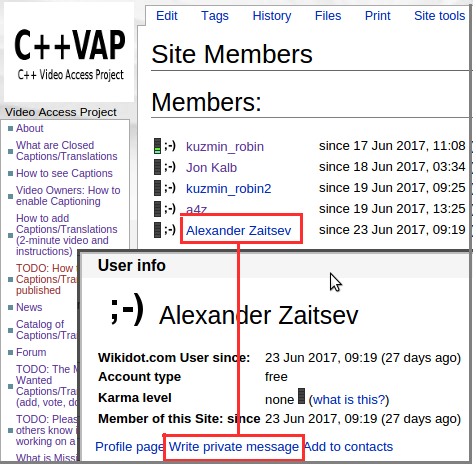 are to be editable by the users registered on wikidot.com (no C++VAP membership is required). Feel free to discuss the changes on our Forum and send private messages to the Site Members. Wednesday Open Content session: Session Abstract, Presentation Video (15:03, English), CppCon Recording (23:54, with Q&A, Captions, and Translations). The Telegram channel for C++VAP is https://t.me/cppvap. Use this autoinvite to access the Slack Channel for this project. A C++ video can be translated to multiple languages, so the speaker can be seen by a much broader audience. This is an ambitious undertaking, but with community support, we can make it happen. YouTube supports community contribution of captions to videos. 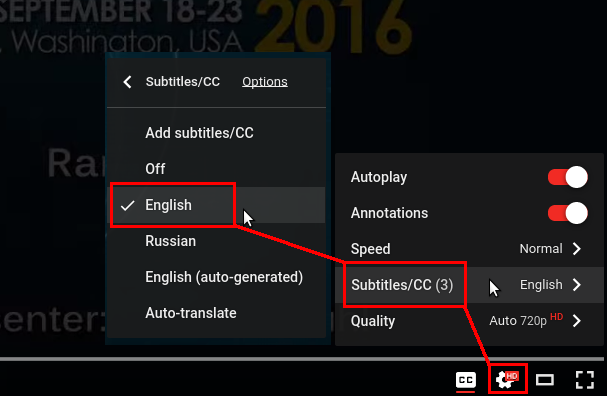 Anyone with YouTube/Google account can submit new captions (for the videos where the owner has enabled the Community Contributions; for C++Now (BoostCon) and CppCon videos those are enabled). The submitted captions are published after a review and approval. Experiments have shown that the first and the main step to multiple language translations is to create the captions in the video's original language (currently mostly English), after which the translation is a relatively straight-forward task. If you are a speaker you can significantly accelerate the translation of your video if you contribute the video's original language captions. Most of this job is already done by YouTube, it provides the auto-generated captions which have no punctuation and suffer from multiple errors. You just need to edit those. You do not need to edit all the captions yourself, but you are in the best position to create the captions that capture what you want your message to be. If you speak a language other than the video's original language, you can also submit the translation for that language. Here is what you need to do on a PC. This 2-minute video shows the process (if you contribute the original language captions then the captions will already be pre-filled-in with the auto-generated ones). The page also has information on collaboration and the review process. The goal is not perfect transcriptions. The goal is to try to capture the intent in as close to correct language as possible. Strip out the false starts of the sentences and the unnecessary linking words like “Uh”, “so”, etc. Make the captions say what you wish you had said. Not only is this clearer for anyone reading the original language captions, it makes foreign language translation much easier to get right. Using the gear icon you can slow down the video (with half-the-speed you can see what the speaker will look like after a bottle of vodka :-). You can drag the captions to any part of the video (it will affect your own preferences only). After the new Captions/Translation is published don't forget to update the News and/or the Catalog of Captions/Translations. Here is the result of one of our experiments: CppCon 2016 Lightning Talks: Dietmar Kühl “Range for" (3 minutes). The video has Captions in English, Russian, and auto-generated English (here is how to see the captions). During the first few seconds the top right corner of the video shows a Card reminding the viewer that other languages can be turned on (this might not be seen on some smartphones in some browser modes). Currently those Cards can only be added manually by the YouTube channel admin/manager. Post your questions, notes, wishes, proposals regarding the captions and translations on our Forum or send the private messages to the Site Members.